Operation International Team New York embarked on a 10 day mission to Linares in the Maule region of Chile. The 18-member team included General surgeons, OB/GYN surgeons, a Thoracic surgeon, a Plastic surgeon, a Critical Care Physician, anesthesia providers, and a complete staff of nurses. During it’s time in Linares, the team performed 85 surgeries, many of them complex. The patient population ranged from infants to the elderly, and they were treated for variety of conditions. Some of these surgeries were life changing cosmetic procedures and some were lifesaving complex operations. Our goal of reaching out and positively touching as many lives as possible was achieved. As Dr. Kothuru, who was the team’s leader stated, “Each mission brings a unique opportunity to directly impact people with free surgical care and also provide support to the local healthcare system by sharing ideas and donating medical equipment.” This year was no exception. Approximately 1,400 pounds of supplies were packed to perform free surgeries for the people in the Maule region. 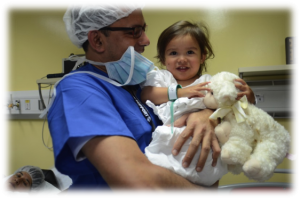 A month prior to arriving in Chile, Operation International contacted local physicians, packed supplies and donations that would treat, educate and sustain the specific healthcare needs in the region. Operation International donated approximately $30,000 in equipment and medications. 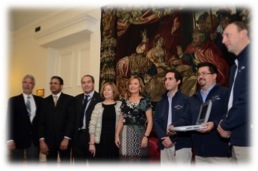 One of the donations was a portable ultrasound machine for a group of Chilean physicians that called themselves the “Flying Doctors”. This group was formed after the earthquake of 2010 to help people who did not have access to healthcare after that disaster. This machine will enable them to diagnose medical conditions in a non-invasive manner, allowing for earlier and more precise treatment. When we heard about their work, there was a great sense of satisfaction to be able to support a group that shares the same values as Operation International. The mission provided Operation International with the opportunity to experience a new culture while working in less than optimal conditions. Challenges were presented to each provider to be creative and resourceful. Many of the patients that were treated on this mission waited an average of 3 to 10 years for their operations. These “routine” surgical problems sometimes became major complex procedures, and require the expertise of multiple surgeons. 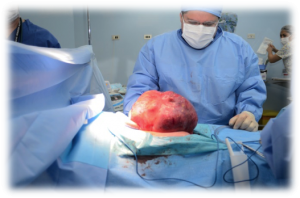 Dr. Vito Alamia and Dr. Geri Schmitt had one such case in which a patient that was scheduled for a routine hysterectomy and then was found to have a ten pound tumor that had become invasive. If this patient had been treated several years prior, this could have been a routine procedure. Luckily this patient did very well and was able to be discharged from the hospital before the team left Linares. Each mission has its own personality which is usually determined by the people you team up with, and also how the host country receives the team. This year, the overwhelming sentiment from the team members was that this mission was smooth and fluid. Operation International teamed up with the GlorialMistral Foundation led by Gloria Garafulich. Her extraordinary work made this trip one of the most memorable for the team. The people of Linares, Chile welcomed the team. Our hosts at Hospital de Linares were extraordinary and hardworking. They were always accommodating, providing support and leadership so that Operation International could make the most of its limited time. A professional camaraderie developed during the week when long days became late nights. Operation International would like to send our sincerest thank you to all the healthcare providers, translators and support staff that worked with us In Linares. We would also like to thank all those who donated and supported this mission, without you none of this would have been possible. Older PostWitness to Life’s Cruelty!